A salt marshy land, illuminating the Thar Desert on a full moon night is a sheer sight that cannot be missed. And that’s how the famous White Desert of India – Great Rann of Kutch is often described by travelers from all around the world. Lying between Gujarat in India and the Sindh province in Pakistan, this mesmerizing sight has been a hotspot not only for tourists and travelers but also for many writers, photographers and poets; especially between the months November and February. It is in these months the famous Rann Utsav is held every year. If you are planning to visit this beautiful seasonal salt marsh land, make sure you come during this festival and take a walk around the place on a full moon night. Believe it! The magical sight of the glittering salt under the moonlight will take your breath away. 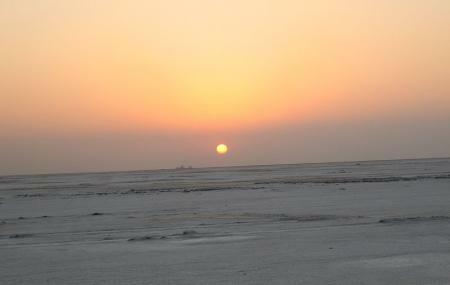 Best time to visit the desert is during Kutch festival. Early morning hours or early evening hours are the best time to visit the desert. How popular is White Desert? People normally club together Prag Mahal Palace and Narayan Sarovar while planning their visit to White Desert. White desert is a sight to behold. It is very beautiful in the day and very mesmerizing at night. The desert is white because of a layer of salt over the desert sand. Best time to visit the desert is from late November to early March. Plan your visit in such a way that you can visit the desert on a full moon night. Highly recommended!! It's beautiful, calm, serene and a great place. People should experience it. A different place in itself to visit. Sunrise viewing was also a great experience. People should wear willen clothes, jackets, gloves, woolen cap properly to counter cold wind and chilly winter. People can also enjoy camel ride here. A tourist destination that must have in your list. Must visit once in life. Lots of thing to enjoy there and near by places. Beautiful scenery and especially don't miss sunset scene. The best day to be here is full moon day. A different terrain altogether. You see the White desert as far as your vision can go. The sunset and sunrise is mesmerizing... Try to make it in government accommodations. The staff is super helpful and courteous. Even in the land which is almost uninhabitable, they were selling packaged water at MRP.. Hats off to the dedication and honesty of the people.